We had a dream.....to build a Mountain Home in Estes Park. Rocky Mountain National Park has become an annual vacation destiny for Sandy, me and our four children, since 1971. Perhaps like you and thousands of others, there is just something inspiring about the Rockies rising up above Estes Park that lures one into the Park and makes one need to explore and want to stay. To reach our dream we acquired a lot in Thunder Mountain August 2006. Sandy and I believed a family mountain home would be a place that would continue to foster the close family relationship we have with our adult children and now our grandchildren for another generation; and with the Rocky Mountain National Park. We had a simple but functional open-plan design in mind that would be invigorated by the mountain environment and enhanced by the spectacular view of the Mummy Range. To realize our dream we needed to select a quality custom home builder that had the “know-how” to construct a mountain home. Since we lived in Omaha, NE some 560 miles from Estes Park we needed to select a Builder with integrity, someone we could trust; a Builder that would build within a fixed budget and schedule; a Builder with a proven reputation that could demonstrate the capability to construct a mountain home to an agreed quality without problems. As an architect I developed the plans, pre-qualified quality Estes Park custom home builders, competitively bid to confirm the budget, selected the preferred builder and negotiated the final price based upon a final design and agreed quality specification. We contracted with Jeff Moreau to be the “builder of choice” for our new mountain home. Dallman Construction broke ground August 8th 2008, building throughout the winter months substantially completing construction and obtaining the Certificate of Occupancy May 14, 2009 (9 months). The whole of our family enjoyed our new Mountain Home over the long May 25th Memorial Day weekend. We achieved our dream. Character – Jeff and his crew were always on time, always with constructive advice, always with a positive “can-do” attitude. Sandy and I, without reservation, are pleased to enthusiastically recommend Jeff Moreau, Dallman Construction as a quality custom home builder that knows how to build and is an individual you can trust! You are welcome to personally inquire of either Sandy or me any further discussion, Omaha, (402) 333.2427 or Estes Park (970) 568.1888. Jeff is always welcome to personally show our home to those that are considering Dallman Construction, perhaps as your “builder of choice”. This letter is written to anyone who would like to know about our experiences with Dallman Construction Company and especially with Jeff Moreau, our builder. My husband Jim and I researched several builders in the Estes Park area before settling with Jeff Moreau to build our home. Everyone we asked suggested Dallman Construction and we are very pleased that we used this company. We worked with Jeff Moreau and an architect to begin the plans for our home. Jeff gave us suggestions and solutions but was clear that it was our home and we could do just about anything that we wanted. He researched codes and restrictions in the Estes area and guided us to what became our beautiful home. Jeff was always available and prompt when we had questions. He even met us at the property when we began to build and brought a ladder so we could see our "view" from what would be the main floor of our home. I think the thing we appreciated most about Jeff was that he was extremely honest and trustworthy. Each aspect of our building was completed as we had expected. Although there were a few times when the bids came in above estimate, most of his figures were accurate and fair. There were no surprises. The subcontractors who Jeff hired were all top notch craftsmen. The work on the home was exceptionally well done from the trim carpenter to the painter. The lighting specialist and tile and carpet company representatives were also wonderful to work with and we could see why Jeff uses their companies. When we came up on weekends to see the progress of the building, the site was spotless. Jeffs crews cleaned up before they left for the weekend and always left the area clean and safe. Our home is a beautiful place for family and friends to gather and enjoy the beauty of Estes Park. People exclaim about the view, the structure of the home and the fine quality workmanship. We are extremely pleased with our home and cannot recommend a better contractor to work with. Please feel free to contact us at 303-423-8085 for further information. This letter is intended to thank you for the construction of our new home. We have never built a home and this experience has been not only a time to learn and plan, but with your guidance, it has gone smoothly and the outcome very satisfying. During the entire building process, your attention to details, prompt replies to our questions and your implementation of all of our ideas, made the 11 months of construction, go swiftly and accurately. As you know, Stan has a lot of experience with industrial construction and your respectful collaboration with him was a bonus. The quality of construction is exceptional. We saw many homes in many cities, for years, before committing to this project. We are so pleased with the work of all of your “subs”. The many guests that have come to see us from out of town, many who have built homes in other parts of the US, have been very impressed with the quality of our home. Local residents have also declared that we selected such professional builder with integrity and skill. The end result for us, is a dream home! NO nightmares, as some have described with similar projects from other builders. We could not be happier with our home and extend our gratitude to you. Please feel free to share this note with any prospective clients that consult with you….we would welcome an opportunity to demonstrate to them just what a spectacular outcome you gave us. We write to express our complete satisfaction with our recently constructed home at 75 Bulwark Ridge in Glen Haven. We couldn’t be happier with the job you and all your subcontractors did on our home. Equally important, working with you is easy, and satisfying. Having had considerable experience in construction, and the usual problems, we were initially unsure how the process of building a custom home without being able to be there daily would go. Your professionalism, attention to detail, and the highly organized system of selection of appointments, appliances and finishes you have developed made the entire process painless. Our project was both on time and on budget and the quality of construction is absolutely the best. We have a home we will be proud to own and we will be happy to tell anybody that Dallman Construction built it for us. Thank you from both of us. We personally want to thank you and the Dallman Construction crew for all the hard work extended in building completion of our Estes Park dream home. As you know we did not plan on building a home because of the horror stories we have heard about builders/subcontractors on general in Estes Park. However, after meeting you and talking to several happy people whose homes have been built by Dallman Construction we thought we would give it a go. To our amazement and complete satisfaction we were in our new home in 6 months as promised. Not only was it completed within 6 months but the quality and the house in general has surpassed our expectations. You and your crew's continued attention to detail throughout the building process was assurance we were getting the best. You and your crew, as well as sub-contractors, proved to be very professional as well as personable in providing all related construction/building services. We were especially pleased with Mark, your foreman, who during the last month of building completion, made what should have been the most stressful time in the building process virtually painless for us. He was very pleasant, knowledgeable, professional and accommodating to whatever we needed to have done including any/all changes. We were very pleased with the redwood bench Mark built for us. It turned out just as we imagined it. Again, his attention to detail was remarkable. He should be very proud of the work he completed on our house--we certainly are. In closing we would like to tell you how proud we are of our Dallman home for it is truly a show place. We wish you much continued success and please keep doing what you're doing--because you do it well. May Dallman Construction, known for it's excellence in quality custom home building, proceed its reputation for many years to come. All too often, we as consumers are quick to criticize. It seems like when one finally realizes that they've received exceptional services or work for their money, they fail to convey such recognition or appreciation. Shame on us, in two months it will be six years that we are in the house you built us. In this period of time we have had the opportunity to see the products of other contractors in this town (some good, some no so good). As a result, we feel that we have some idea of what we're talking about; "WE'D DO IT ALL AGAIN WITH YOU'. You have built us a fine house, one which we feel secure and comfortable in. More importantly, we affectionately call this house, "HOME". Thank you, for a major contribution to the enjoyment of our retirement, here in Estes. We are very sorry that we are leaving the beautiful home that you built for us just four years ago. But, unfortunately, the ravages of old age are catching up to us, and we feel it is prudent for us to locate closer to our children. So we are moving to Dover, Delaware. Four years have given us plenty of time to realize we were very fortunate to you as the builder of this house. 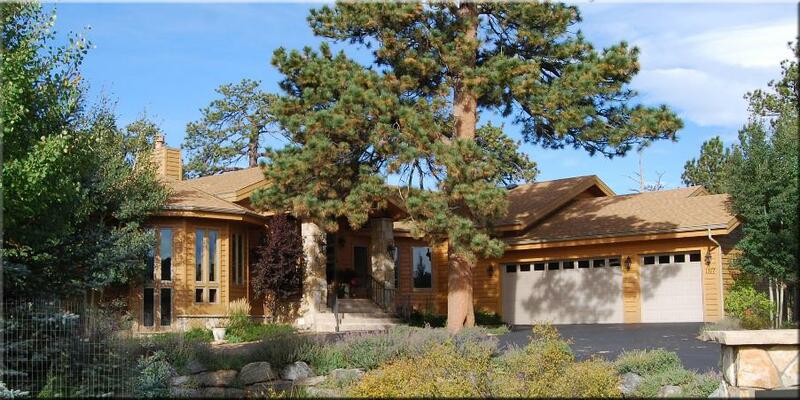 Since coming to Colorado in 1976, we have built three houses: one in Grand Lake, and two in Estes Park. The first two were adequate for our needs because we were younger. But your house is the one we will think fondly of as our "Home in the Rockies", for it had the warmth and beauty which can lift the spirits. Little did we realize during the construction of our home that we were also acquiring a good friend who would help us with the little problems which can seem so large or baffling to the aged or the uninformed. I'm sure you remember showing us how to open and close the sliding doors, helping me remove tripping hazards before Ernestine returned from the hospital, and firming up a railing on the patio. And all of this occurred without contractual obligation. We wish you continued success in your work, and regret that we must say "good-bye" to a mighty fine fellow who happens to be the best builder in Estes Park. In January of 2007 my wife and I contacted Dallman Construction Co. for an estimate on the remodeling of a home we had recently purchased in Estes Park. Jeff Moreau met with us, at our convenience, which was a Saturday morning. He presented us with a complete job cost breakdown and estimate. He went over each item thoroughly and welcomed questions. We were aware of all coasts and how additional items would be addressed. A contract was later presented and signed. We were presented with names of places to contact for lights, appliances, flooring, cabinets, etc. All of the professional at these locations were very accommodating and saved us a great deal of time. We were given a job schedule, which proved to be very helpful for us since our primary home is two and one half hours away. We knew what to expect each week that we arrived to check on the work. Jeff kept us informed though e-mails and phone calls and we felt comfortable contacting him with any concerns. Any questions or concerns were dealt with promptly and professionally. We couldn’t have asked for better communication. The craftsmanship of all the remodeling was superior. We were very pleased with the outcome and highly recommend Dallman Construction Co. WE would not hesitate contact them for further work. It will be a pleasure to have people ask us who did our remodeling! Bob and I would, again, like to thank you for "our home". It has been a year and we love our house more and more each day. We really appreciate the attention all of you show towards detail and completion. We continue to receive many compliments on all aspects of our home. And we share the names of each and every one of you responsible for those comments! I just wanted to convey to you my sincere thanks for a job well done! My wife, Pat, and I are delighted with our new home that you constructed for us in the Reserve community in Estes Park. We were especially pleased that the house was completed ahead of schedule, so that our family was able to enjoy our first Christmas in Colorado. There were several unique circumstances about how our home was designed and built by Dallman Construction that future potential clients might find of some interest. As a professional investor whose entire career has been involved in investing in equities, I viewed the home built at 1040 Elk Trail Court both from the standpoint of a future retirement home as well as a diversification of my stock market investments into real estate. I was particularly pleased to be able to save money by having you help design our home, thereby saving significant architectural fees. By your showing us examples of the work as well as ideas gleaned from your own home, we were able to design and then build exactly the customized home we wanted. We were especially grateful to your many suggestions during the design process, including the 2nd deck, plus locating the home to take maximum advantage of the outside views. The quality of the workmanship and attention to detail is very apparent in the final result. Both you and your construction crew need to be commended. Again, you finished our home well ahead of schedule (less than 6 months from start up), and would encourage others to work exclusively with you from design through construction. We’ve done some re-modeling to our home(s) in past and none have gone as well as our cabin renovation with Dallman Construction. Three things made the difference in our minds: great upfront communication, excellent quality workmanship, and super follow up by you and your subcontractors. Jeff Moreau is an absolute pleasure to work with. We’ll be calling you for any work we need done in the future. We do not take these kind words for granted. We work hard every day so that all of our clients can feel confident that they have chosen the right people for the job. We will do everything in our power to make sure you are happy with your home and builder.